These questions & answers were originally published in “The 10th anniversary of Huang’s Tai Chi Chuan Association (Malaysia)”, a year book about Grandmaster Huang Sheng Shyan’s 10-year teaching. 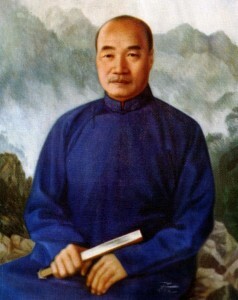 Huang was one of Cheng Man Ching’s senior disciples and main representative in Malaysia. Questions and answers on Tao of Tai chi Chuan by Master Huang Sheng Shyan. Answer: Tai Chi Embodies a comprehensive set of knowledge, developed and handed down by our learned predecessor with mystifying principles and profound philosophical learning’s. The Tai Chi movements are scientific as the principles are based on scientific fundamentals. Our predecessors developed the art for improving human health, warding off sickness, slowing down the aging process, achieving longevity and defending one self. All this benefits mankind and society. Good character formation is promoted. An adherent imbibed with the Tao (or philosophy as a way of life) of Tai Chi would contribute towards proper governance of the country and universal peace. The movements can be developed and modified but the principles are eternal. The external forms may differ from person to person but the principles are standard and unvarying. Because of this, there is no basis for differentiation by schools. Instead, a spirit of a single family should prevail. Common interest of art should take precedence over personal interest. An open attitude should emerge, bearing in mind the spirit of the founder and the predecessors to propagate the philosophy of Tai Chi throughout the world so as to improve the health of mankind. Answer: The gap between accurate and non-accurate achievement is wide. Remember the words of the old master, Wang Tsung Yueh that the body must be naturally and vertically balanced bearing in mind the principles of being relaxed, rounded and awareness of the various parts of the body. During practice of the set movements, one must be careful, conscious or alert, observant, and must feel where one is moving. Otherwise there is form without substance and deception to people. To achieve accuracy, the principles of Tai Chi must be followed in addition to correct methods of practicing. A good master is necessary coupled with one’s own constant research. The art must be learnt progressively having to be on firm ground first before advancing to the next step. Personal requirements are also important. One must be determined, confident, persevering and motivated. A secure means of livelihood and having normal environment coupled with single-mindedness, constant learning and practice and clear understanding of the principles thoroughly – all this will lead to achievement of accuracy. This is in contrast to those who want to learn fast, who concern themselves with the external forms and who learn and practice sporadically. Those hope to learn first and be corrected later not realizing that it is worse than having a new person learning from scratch. Others take the principles of Tai Chi lightly or superficially and liken the art to a common exercise, drill or dance. All this has form but no substance. One’s body must be likened to a perfect machine where a wrong spare part will affect the operation of the machine. The founder of Tai Chi has said, “Achieving the Tao is important, acquiring skill in the art is secondary; not learning my Tao, he is not my student.” Therefore also important would be honesty and righteousness or a good moral character. 3). Question: There are different forms of Tai Chi. Are the principles different? Answer: The founder created the art. But through the years, the forms of Tai Chi have differed: some have 24 basic movements while others have 37; some have 64 set movements and some have 72 while others have 108 movements or even 124. There are long sets and short sets. Movements have been large and expansive and have been small and compact. Some emphasized high postures others opt for low ones. Some practice slowly others practice at a faster pace. Men write all this divergence. formation has advanced to the stage of “non-self” and of non-resistance so that the whole body is used and hands are no more used as hands. Youthfulness and longevity are attained. It is not easy to master correct forms as the chi and the principles of the art are internally harmo nized. Harmonization is also to be achieved between the upper, middle, and lower parts and between the left and right of the body. Even though difficult it is relatively easier to master correct forms compared to acquiring skill in the art. 4). Question: Is it better to practice Tai Chi more frequently or less frequently? Answer: There are no extremes in Tai Chi. The essence is in the training method. If the method is not correct, it is no different from ordinary drills with a lot of time spent but relatively little achievement. So it is not a question of practicing more or less frequently but practicing correctly. That is, the central equilibrium must be vertically maintained. Every movement must be disciplined such that the posture is vertically balanced. The principles remain unchanged: There is straightness in a curve and vice versa. There must be constant learning and practice, understanding the principles and the less obvious points. Mastery of this will produce skill naturally. There is no question, therefore, of practicing too much or too little but rather of practicing correctly. 5). Question: Is it correct to practice the art fast or to practice it slow? Answer: The earth rotates at a constant and specific rate. Similarly, Tai Chi should not be practiced too slow or too fast but should be practiced comfortably. The human body must be moved naturally otherwise there would be weakness. If the practice is too fast, breathing is affected resulting in uneven respiration, breathlessness and the heart pulsating too fast. If the practice is too slow, the limbs and the joints become stiff. Chi is blocked and is locally stagnant: intent or consciousness is employed but the Chi is not flowing. Internal force and chi must be synchronized. Internally, there is the harmony of the libido, energy, chi, and spirit while externally, the mind, consciousness (or intent) and body are also harmonized and in turn both the internal and external harmonies are synchronized. Muscles must be relaxed and all parts of the body are naturally without tension. It is not possible therefore to say practicing fast is correct or practicing slow is correct as this has to be based on the standard or level of achievement of the student. One must practice until the whole body is relaxed and comfortably balanced. Once there is internal and external synchronization, then the question of slow and fast in practice is unimportant. At this stage, one gets the feelings that the upper portion of the body is like the drifting of clouds and the lower portion is like the flowing of water. Consciousness is continuous and is harmonized with mo vement. All parts of the body are natural and are unified. There is then no question of being fast or slow. External and internal balance or harmony must be cultivated where there is no slanting of the central axis of the body. When hind force is invoked, the hind knee being bent will move up or straighten slightly though the height of the body remains unchanged. This is so as consciousness (or intent) and chi would “close” centrally instead of coming up while the bended knee is used to adjust accordingly. Consciousness is used to lead the muscles in relaxing. Joints, muscles and ligaments must then be loosened, relaxed, and “thrown” open but still linked. The body is then erect and comfortable. Consciousness is also used to “move” Tai Chi principles to all parts of the body. Having achieved “four balances and eight steadiness,” the question of high and low postures is then answered individually. Answer: The muscles, the skeleton, and the nerves are parts of the body system. When practicing movements, the use of consciousness to sink and relax the body is most important. The center of gravity is moved while preserving the uprightness of the central axis of the body. It is important to focus on steadiness, tranquillity, relaxation, and rootedness. The internal movements propel the external movements in a continuous or uninterrupted fashion. Internal force is generated with turning movements. After a long time, the whole body is in balance. When left and right is distinguished, one is substantial and the other insubstantial along the pattern of “cross alignment.” For example, together with the distinction between top and bottom parts of the body, when the left upper part of the body is substantial, the left lower part is insubstantial and similarly when the right upper part of the body is substantial, the right lower part is insubstantial. This pattern of cross alignment is used in shifts of the center of gravity from one leg to the other. This is similar to the “cross-roads” of the nervous system. When moving chi, therefore, one must separate substantial from insubstantial, move the step without moving the body or moving the body and not the hand. If in moving a step, the body also moves, then it is not separating substantial from insubstantial. If in moving the body, the hand also moves, then the shoulder and the hands are not relaxed. It is important to follow the principles of using consciousness to propel movement. The top and bottom, left and right portions of the body must be coordinated. A rounded grinding stone may move but the center is not moving. All the parts of the body become one system characterized by lightness and agility, roundness and smoothness, even respiration, alternate opening and closing like that of the sea where with movement from one part of the sea, all parts are also moved. The movements are guided by consciousness and are properly regulated like the regular movements of the waves in the sea. Answer: Take the five loosening (or relaxing) exercises as an illustration. These exercises are based on Tai Chi principles. During practice there must be full concentration since any distraction will nullify any effects. Bear in mind the 3 points of non-mobility: the head which must be locked onto the body, the hands which must not move of its own volition and the soles of the feet which must be still and rooted to the ground. Consciousness (or intent) will lead the chi along. Steps are made without affecting or moving the body. Turning movements start from the waist and hips with hands propelled from the waist and hips in accordance with the principle that all movements originate from the waist. Principles must be understood and no movements are separated from the principles. Once you make it internally you are also “through” externally. Once you are fully relaxed, you can change according to circumstances and can therefore, neutralize an oncoming force. You would have reached that position of “non-self” where the whole body is the weapon and hands are no more used as hands. If you are not able to usefully apply your movements then you still have not understood the basics of the five relaxing exercises. If you have not mastered the essentials, then there is no point of talking about application of the movements. 9). Question: What is the rationale for relaxing the abdomen and withdrawing the coccyx (or tailbone)? Answer: Chi is stored in the Tan Tien as a result of using consciousness to sink the chi to this point. From here chi should circulate to the whole body. If chi just remained in the Tan Tien, then the abdomen will have the sensation of being stuffed. Only when chi circulates throughout the body will the abdomen be relaxed and pliable. After a time, the abdomen will acquire some “bouncy” or “springy” effect and chi would have been circulating to the whole body. Chi can be occluded or absorbed into the backbone. The Song of Thirteen Postures says, “If the abdomen is thoroughly relaxed, then the chi will rise.” So do not just store the chi in the abdomen otherwise it will simply bloat. Having the coccyx withdrawn means there is no protrusion of the buttocks while making sure at the same time that the hip joints are not “sliding” forward. This must be combined with relaxing the abdomen and both requirements must be met at the same time. Otherwise, there is no rootedness while the waist is stiff resulting in vertical imbalance or dis -equilibrium. It is important to maintain the uprightness of the central axis of the body in order to achieve central equilibrium. A test can be made as follows to see whether all this has been done correctly all along: use one thumb to press the abdomen and release the thumb suddenly. There should be a bouncing or springy effect of the abdomen. At the same time, the seat of the buttocks behind should be very soft to the touch. 10) Question: What is the true spirit of Tai Chi? Answer: Good and famous masters of Tai Chi teach the same stuff but students will learn differently. This is because students differ in their natural endowment and physical make-up. The real acquisition of the art is not in just mastering the external forms but also in mastering the principles and philosophy. The learner must also be a man (or woman) of reason having learnt, practiced and understood the art successfully, he (or she) applies those principles and philosophy to daily life. He (or she) is wholeheartedly devoted to Tai Chi. He (or she) shares the founder’s spirit of striving for humankind to be physically and mentally healthy. This would be the true Tai Chi spirit. Practicing too much or too little is subject to whether it is practiced correctly or not. Utilizing my experience and following my practicing technique, students are encouraged to practice every morning and evening using about 5 minutes to practice a particular movement or posture (dividing each of them into 2 parts) over and over again. Those students who do so are likely to succeed. Answer: A lot of students are using wrong learning and practicing technique. Students must start with understanding the Tao or philosophy, then the principles, then using the correct method and finally putting in the effort. He must understand the relationship of man and his surroundings or the universe and use the method of chi to practice. He must be humble and persistent in his practice. Slowly, rootedness will result and the method of practicing is understood. Understand the principles and be aware of the less obvious and unnoticeable aspects in slowing acquiring skill. Being rooted and having internal force can never be observed externally. They can be accomplished through correct method. In practicing the movement and developing the internal force, the joints of the body must be loosened and yet linked. The whole body is relaxed and is not easily pushed over by an opponent. Substantiality is distinguished from insubstantiality. Aim to be flexible and pliable like a snake whose tail will come in to help if you attack the head, or vice versa or whose tail and head will assist when the center is attacked. Be responsive to consciousness (or intent), then tranquillity and pliability can be achieved. It is easier to lift off a 200 katies iron rod than to lift up a 100 katies iron chain. This illustrates the principles of thoroughly relaxed joints. Students must also understand the application of yin and yang in the movements and push hand exercises. Yin and Yang principles are in Tai Chi which encompasses the universe: all movements whether divided according to upper and lower body, right and left, front and back, internal and external must not deviate from the principles of substantiality and insubstantiality. Moving and stillness alternate continuously: Yin does not part from Yang and vice versa. When Yang moves, Yin also moves and vice versa. This principle must be understood when practicing the set movements. The body and the character is trained together as is the acquisition of the Tao and the art. Tao is likened to yin while the art or skill is the yang. Yang is evolved from yin and yin’s completion. Being relaxed, stillness and being rooted become yin components. Neutralization of force forms the basic foundation where no strength is used. Stillness is like that of the mountain. No change is seen but it is capable of a lot of changes. The founder has said, “Tao is the basis, art is consequential.” One must therefore acquire Tao by learning not to resist, for only then will the body learn to be obedient. In attacking and defending, one must understand the method, then acquire insubstantiality and quietude. Only then will the defense be solid. Attacking will also be successful as one is naturally comfortable. In pushing hands exercise, one must learn to achieve non-resistance and stickiness. Having achieved stickiness, then one can achieve the ability to neutralize force. With adequate reserves, the neutralizing ability is applied with an involuntary exertion of internal force. Answer: In the present day, science is very advanced affecting all aspects of human endeavor day by day. This gives rise to stress and keen competition in business having a telling effect on the spirit. This is a common malady. This is why Tai Chi an ancient art, is popular and a common practice. It has no secrets. It is equitable to all as it discriminates against no student. But students often commit errors in practicing the art. 1) Respect the teacher and accept the philosophy or Tao of the art. 2) Be honest and do not take unfair advantage. 3) Be conscientious and serious, think, observe, and feel or being aware during practice. 4) Progress step by step. 6) Follow all principles mentioned earlier when practicing by themselves.